The animated sequel, plus an all-new adventure, will kung-fu kick Blu-ray this December! 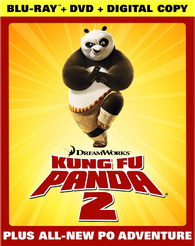 In an early announcement to retailers, DreamWorks has revealed that 'Kung Fu Panda 2' will hit Blu-ray on December 13. Combining non-stop action, beautiful storytelling and stunning animation, the “winning sequel” (USA Today) delighted viewers of all ages with its engaging story that is both “hilarious and full of heart” (WABC-TV). The film earned more than $650 million at the global box office, making it one of the top five films of the year worldwide. In addition to the smash hit film, the 'Kung Fu Panda 2' Awesome Packs feature the exclusive debut of the all-new Po adventure 'Kung Fu Panda: Secrets of the Masters' plus two free memberships to the popular online game universe Kung Fu Panda World. In the action-filled companion story 'Kung Fu Panda: Secrets of the Masters,' Po and the Furious Five uncover the legend of three of kung fu’s greatest heroes: Master Thundering Rhino, Master Storming Ox and Master Croc. Kids can then follow in Po’s footsteps to become a kung fu master with Kung Fu Panda World, the virtual online game universe where kids create avatars, play games with their favorite characters, win points towards earning a kung fu black belt, chat with friends and more. The Blu-ray/DVD/Digital Copy combo pack will feature 1080p video, a DTS-HD Master Audio 7.1 soundtrack, and supplements will include: Filmmakers’ Commentary; Sneak peek episode of the upcoming Nickelodeon TV series “Kung Fu Panda: Legends of Awesomeness” (HD); Meet the Cast (HD); Panda Stories: Inside the World of the Giant Panda (HD); Kung Fu Shuffle (HD); and more! Blu-ray exclusives include: The Animator's Corner, Trivia Track, and Animation Inspiration. SPECIAL BONUS: Kung Fu Panda World: Get two free memberships—each good for game play through April 2012 and valued at $5.95 each per month—to the online virtual game world where kids create avatars, play games with their favorite characters, win points towards earning a kung fu black belt, chat with friends and more! Membership codes must be redeemed by and free membership will expire on 4/30/12. Additional restrictions apply. You can find the latest specs for 'Kung Fu Panda 2' linked from our Blu-ray Release Schedule, where it's indexed under December 13.